Wireless sensor networks (WSNs) are often deemed as appropriate solutions for environmental surveillance and real-time monitoring applications. In the past decade, WSNs have gained a lot of attention from the research and industry community. Countless research projects have been launched to study different aspects of WSNs and yielded fruitful results. The uses of WSNs nowadays, however, are far restricted by many theoretical or practical obstacles. For examples, most WSNs adopt un-rechargeable batteries with limited power supply. The wireless links among the sensor nodes appear to be unreliable and easily affected by various environmental factors. Nevertheless, there is hardly any fundamental result on the data collection capacity of a duty-cycled WSN with unreliable wireless links. Further considering the faulty behaviors of sensor nodes and the difficulties of outdoor deployment and maintenance, a real WSN system often fails to support long-term large-scale applications with guaranteed performance. What are the fundamental challenges in long-term large-scale WSNs? Which research and technical issues must be addressed? Where are the potential design spaces of future WSN research? The research and industrial communities are in urge need of the answers to the three questions. Under such circumstances, we launched GreenOrbs, a WSN system of 1000+ nodes to operate in the forest for over one year. Through the experience in GreenOrbs, we gain considerable insights on the challenges and design space in long-term large-scale WSNs, such as energy consumption, scheduling and synchronization, routing efficiency, link estimation, encapsulation, deployment, diagnosis, and fault tolerance, etc. The participation of GreenOrbs are from several organizations, including Hong Kong University of Science and Technology, Xi'an Jiao Tong University, Zhejiang Forestry University, Illinois Institute of Technology, Hangzhou Dianzi University,Tsinghua University, Beijing University of Posts and Telecommunications and Nanyang Technological University. We design a generic estimation model that works for non-vertical irradiations of sunlight and various vegetation species. We design and produce firm weatherproof sensor motes that are sustainable for very long time in the wild environments. 3. Processing of uncertain sensory data. The sensor readings are often error-prone due to the complex deployment environment and diverse instrumental errors, which may lead to inaccurate measurements. 4. Distributed cooperative node state monitoring. A distributed cooperative mechanism is designed for sensors to accurately judge their statuses in a distributed manner so as to save computation and transmission cost. From a macroscopic view, GreenOrbs is facing more research challenges towards a long-term kilo-scale WSN. GreenOrbs is motivated by the need of long-term large-scale sensing for continuous environmental surveillance, precise forestry measurements and forestry research. 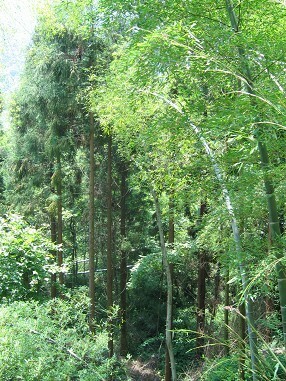 The first application of GreenOrbs is canopy closure estimates. Canopy closure is defined as the percentage of ground area vertically shaded by overhead foliage. It is a widely-used indicator of the forest condition and has many significant uses in ecosystem management and disaster forecast. Previous forestry approaches of canopy closure estimates have either poor accuracy or prohibitive cost. Using WSN as a technique of quantitative measurement, GreenOrbs realizes accurate and economical canopy closure estimates of vast forest. 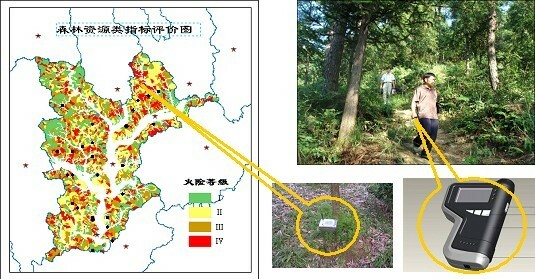 Another application of GreenOrbs is fire risk evaluation of forest. Traditional approaches provide only inaccurate evaluation according to the macroscopic weather forecast, including temperature, humidity, and wind force. The real fire risks, however, are in fact more related to the local status and human activities on the ground. Using sensor nodes deployed in the forest, GreenOrbs is able tomonitor the local environmental factors and act as important input elements of accurate fire rick evaluation. GreenOrbs is further designed to support forestry research through long-term large-scale observations on the forest microclimate, species interdependence, and competition among different vegetation species.